If you live in Illinois, you’re familiar with the story. But for those of you who aren’t from around the Land of Lincoln (abbreviated LOL), here’s the latest installment in the never-ending story of embarrassment brought upon the state by both Democratic and Republican politicians. On February 2, six short days ago, Illinois voters went to the polls to select the Democratic and Republican candidates for local, state and federal offices in the November general election. In Illinois, candidates for Governor and Lt. Governor run separately in the primary, while the candidates nominated for these two offices run as a team in the general election. The separation of these two office in the primary raises the possibility the Governor and Lt. Governor nominees may not even know each other up to the point they become running mates. It also means that people who are ideologically incompatible, and may even share a strong, personal dislike for each other, can be paired as running mates. It’s a great system, but I digress. The race for Lt. Governor on the Democratic side was crowded this year, which is, in itself, somewhat amazing considering that the Lt. Governor usually doesn’t have much to do much unless the Governor stops breathing. Two of the candidates who ran for the nomination are current members of the Illinois House, and two other candidates serve in the Illinois Senate. A fifth candidate was a young electrician with no political experience, and the sixth and final candidate was a pawnbroker who had never before voted in a primary election. The Democratic power-brokers thought the Lt. Governor nominee would be one of the four current members of the Illinois house and senate who were vying for the position. So they really didn’t pay much attention to the non-pol candidates, even though it had been reported earlier that one of them, Scott Lee Cohen, had a checkered past. I mean, seriously, could Illinois Democrats nominate a pawn broker, with no political experience and a questionable background, to be a heartbeat away from having to run the State of Illinois, a billion operation faced with a near billion budget deficit? No way could it happen. 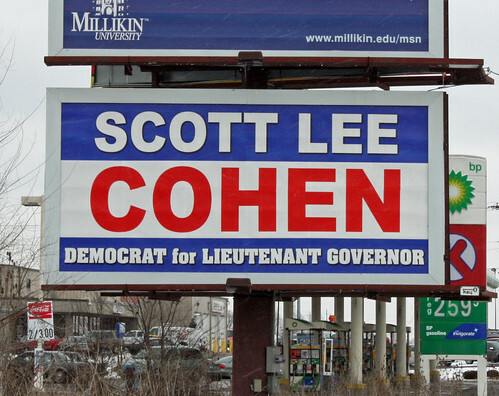 But this is Illinois and, in last Tuesday’s primary, Illinois Democrats gave Scott Lee Cohen, the pawnbroker with the little-known but not totally hidden past, the Democratic nomination for Lt. Governor by a comfortable 30,000 vote margin. The Feb. 2 primary had some close races that held the focus of the punditry on election night and the day after. Only 8,000 votes, out of over 912,000 votes cast, separated the two Democrats seeking nomination for Governor. And in the race for the Republican gubernatorial nomination, the top two vote getters (in a seven candidate field) were separated by just 420 votes. The Democratic race has since been decided in favor of the incumbent, but it may be a few weeks before the Republican nomination is decided. With all the interest in the close gubernatorial contests, the story of the pawnbroker with a past really didn’t get traction until last Thursday, two days after the primary. First came the not new, but newly reported revelation that Cohen had been arrested in 2005 on a domestic battery charge. His then-girlfriend had called police after Cohen allegedly held her against a wall while holding a knife to her throat. Although the charges were dropped when Cohen’s girlfriend failed to show up in court, the police report indicated there were abrasions on the woman’s neck from a knife wound, along with cuts on her hands from her trying to fend off the attack. Not a good beginning for a newly minted candidate, but this was just the tip of the iceberg. It turns out the girlfriend had been arrested six months prior to the knife incident for prostitution, which led to questions about how Cohen had met the woman. We soon learned the romance began in a message parlor. Hmmm. You probably won’t be shocked to learn Cohen was going through a divorce during this time, nor that the papers from the divorce contained more damaging information. In the papers, his then-wife alleged that Cohen’s use of anabolic steroids had led to a pattern of violence against family members. There was a tidbit about Cohen allegedly trying to force himself upon his wife, and also sending threatening notes to her (some written in lipstick on a mirror). Early in the controversy, Cohen, without checking, actually offered his ex-wife and former girlfriend to come before the media to defend him. While the ex-wife did say he was a different person today, she didn’t retract any of the claims made in the divorce petition. And the ex-girlfriend, who by this time was being represented by attorney Gloria Allred (often seen on Nancy Grace as counsel for the celebrity-of-the-day), really didn’t help matters when she said Cohen was unfit to hold office. Ouch, but I guess that’s payback for Cohen’s having held a knife against her throat. During the first 48-hours after the story broke, Cohen was defiant about leaving the ticket. A highly-checkered past does not automatically disqualify a person from office and, in the absence of current charges, Illinois Democrats had no way of forcing Cohen off the ticket. So if Cohen wouldn’t budge, Governor Quinn’s only option would have been to leave the Democratic ticket, and run as an independent. But Illinois Democrats have "been there, done that" in the past, and it just doesn’t work. In 1986, Democrat Adlai Stevenson III won the Democratic nomination for Governor. In the same primary, Democrats nominated two followers of Lyndon LaRouche for Lt. Governor and Secretary of State. Stevenson objected to their platform and refused to appear on the same ticket. He resigned the Democratic nomination, ran as an independent, and was trounced in the general election by the Republican Governor Jim Thompson, who was seeking a fourth term and had narrowly beaten Stevenson four years earlier. The bottom line: Patrick Quinn’s hopes of remaining Governor were gone if Cohen remained on the ticket, and Quinn’s hopes were gone if left the Democratic ticket to run as an independent. Cohen simply had to go. Over this past weekend, the calls by Democrats for Cohen to step-down became broader and more pointed. It was clear that Cohen was being shown the door, but it also was clear the Lt. Governor nominee had yet to make up his mind about whether to walk through it. That all changed last night (when a tearful Cohen, speaking at a press conference from inside a Chicago bar (seriously, a bar with a Super Bowl crowd), ended his bid to become Lt. Governor of Illinois. He is expected to formerly resign from the ticket on Tuesday. Although Scott Lee Cohen’s appearance on the stage of Illinois politics was brief, he certainly provided plenty of fodder for discussion. With Cohen gone, I don’t have anything to look forward to until former Illinois Governor Rod Blagojevich, re-indicted last week on federal corruption charges, becomes a contestant on Donald Trump’s "The Celebrity Apprentice." The show debuts March 14 on NBC and should, at least, be as compelling to watch as former Illinois First Lady Patti Blagojevich’s appearance last summer on "I’m A Celebrity … Get Me Out of Here!" LOL (and crying at the same time) in LOL.